→Vitamix Personal Cup and Adapter – Should You Buy It? The Vitamix personal cup adapter was introduced in 2017 to give owners of classic Vitamix blenders the opportunity to use the very convenient personal cups from the Vitamix S-Series directly on their larger blenders. How does the adapter work and is it worth your investment? One of the newest ranges of Vitamix blenders is the S-Series, otherwise known as Personal blenders, or Space Saving blenders. They were introduced so that Vitamix could get some foothold in the tight market of compact, single-serve blenders, a market that is mostly dominated by Ninja and Nutribullet models. Vitamix currently has three models in the S-series, the S30, the S50 and and the S55. 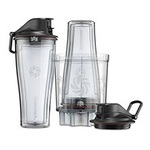 They are essentially a mix of compact blenders and larger kitchen blenders, as they come with both a convenient 20-ounce travel cup as well as with a larger 40-ounce container. You basically get the best of both worlds when buying an S-Series blender. The cups in the Vitamix S-Series are fundamentally different from classic Vitamix containers in that the blades are not fixed to the containers. 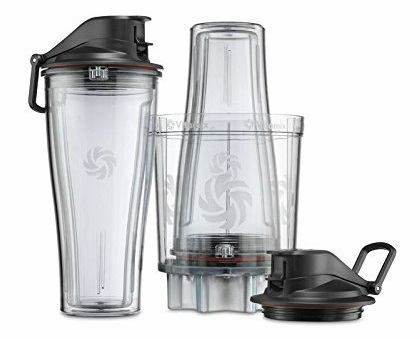 This is convenient as it allows you to pick up this 20oz drinking container from the blender base and drink your delicious smoothie straight away. This also means that if you’re a happy owner of a classic Vitamix blender, you can’t actually use this personal cup to blend. You can of course still purchase this small jar as an extra drinking cup, if you’re a true Vitamix fan. Simply pour it in the cup from your traditional container and drink away. But they are quite expensive as a stand-alone drinking cup, so only do this if Vitamix is the only brand you use. There are of course cheaper drinking cups available. But wouldn’t it be great if you could place that 20-ounce cup straight onto your legacy Vitamix container? This is where the Vitamix personal cup adapter comes in! The personal cup adapter basically transforms your full-size Vitamix machine into a compact single-serve blender. How does it work? Easy! Simply place your favorite ingredients in the personal cup. Then attach the adapter onto the cup, turn it over and place it on the blender base just like you would do with a normal Vitamix container. You then have your green smoothie prepared and ready to go in your personal cup that also comes with a convenient and secure spill-proof lid. You do need to clean the adapter after use though. The adapter has the blades and they need to be cleaned, just like you would have to clean any Vitamix container. The adapter is equipped with laser-cut, stainless steel blades and has a convenient leak-proof seal. The cup is made with BPA-free and double-insulated materials so that your drink stays cool for longer. The personal cup adapter works with Vitamix blenders in the classic C & G series. 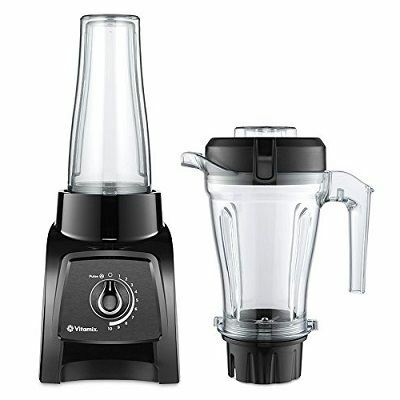 Various names and numbers have been used over time for these blenders, but basically all Vitamix blenders are compatible, except for blenders in the newer Ascent and S-Series. The Vitamix personal cup adapter is a great solution if you’re not willing to invest in a second Vitamix blender but still want the convenience of a single-serve travel cup. Blenders in the S-Series are certainly not cheap, so if you already have a legacy Vitamix blender then this personal cup + adapter is perhaps a better option. One drawback is that the adapter does like a bit clumsy, especially when placed on a blender base, but overall it works great and fast.